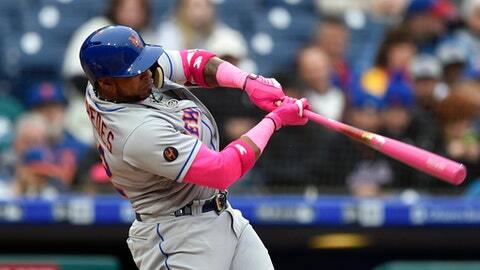 The Mets placed Cespedes on the 10-day disabled list Wednesday with a strained right hip flexor, retroactive to Monday. It will be Cespedes’ fourth DL stint for a leg injury in the past three seasons, despite an offseason focus on better caring for his lower half. Callaway said Cespedes has done ”everything we asked of him” to keep his legs healthy. The 32-year-old was limited to 81 games last season due to leg injuries after signing a $110 million, four-year contract in November 2016. Callaway hopes the time off will allow Cespedes’ hip to heal fully. The Mets aren’t certain Cespedes will return when he’s eligible, but they think 10 or so days without games will be enough to get him to 100 percent. When that didn’t happen, general manager Sandy Alderson and Callaway spoke to Cespedes about the DL. Callaway said Cespedes is good with the decision to take some time off. Cespedes declined to speak to reporters Wednesday. Phillip Evans was recalled from Triple-A Las Vegas and slated to start in left field against Toronto on Wednesday. Evans said he arrived in New York at 6:30 a.m. Wednesday, 6 hours before the scheduled first pitch against the Blue Jays. Callaway also would not commit to activating Todd Frazier (strained left hamstring) from the DL when he’s eligible Friday, saying the team was taking his recovery day to day. Center fielder Juan Lagares injured the big toe on his left foot running into the wall catching a flyball in the ninth inning against Toronto. X-rays were negative, but Lagares was uncertain if he’d be able to play in the team’s next game Friday.